Alistair Matthew, the entrepreneurial kiwi who founded the first mountain biking company on the World’s Most Dangerous Road in Bolivia, says in an interview that the face of tourism has changed. People don’t travel just to snap photos and say they were there. The modern traveler wants bragging rights. The modern traveler seeks to conquer unrivaled perils. The modern traveler doesn’t visit the Yungas Road to say he stood there; he visits it to say he plummeted down the road that the Inter-American Development Bank has named the most dangerous. Similarly, we arrived at Victoria Falls not simply hoping to catch a glimpse of the “smoke that thunders.” (Though what a glimpse it was!) 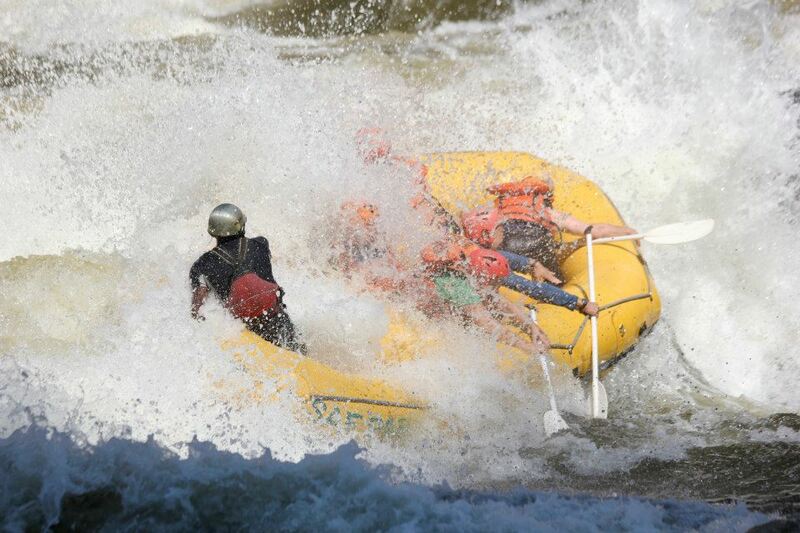 We wanted to plunge into the foamy depths of the Zambezi River and get pummeled by the unforgiving rapids that viciously churn as the river snakes through the gorge. It was the thought of adrenaline and danger that roused us at six in the morning after a late night on a booze cruise down the same river. Some of us were still reeling from the night before, but we strapped on our life vests and helmets and endured the bumpy ride from the campsite to the river. Team BARB, all suited up. Not to harp on precision of language here, but it quickly became evident that ‘walk’ was not the proper word to describe the next hour of my life. (It might have only been twenty minutes, but I was too busy staring a sprained ankle and/or death in the face to track the time.) Being stupid, I did not wear sneakers as the woman had advised. It couldn’t possibly be that bad. Imagine looking over a cliff side, down a vertical drop. There are loose rocks slightly embedded in the dirt there, and a makeshift ladder comprised of wobbling sticks dubiously nailed together. You are expected to climb down the ladder standing up. You may use a rafting paddle. I was barely on the path for five minutes when I fell into a thorn bush. My feet, ill-equipped in flip flops, threatened to slip and catapult me to my doom with every step. Beside me, rafting guides easily leaped downward, their feet a paragon of agility. I hobbled along with a shaky gait that promised a twisted ankle. In the end, our guide Vorsta had to hold my hand the rest of the way down. “Look! Look how far back everyone is. You’re going faster than the rest,” he told me at one point. It was a nice gesture, but all I heard was, “Pathetic.” It’s like applauding someone with a broken leg for using crutches. By the time I reached the bottom, the rapids didn’t even seem daunting anymore. I was practically gushing with gratitude as I clambered into the six-person raft that bobbed gently on the calm section of river we pushed off into. Of course, the calm was short-lived. 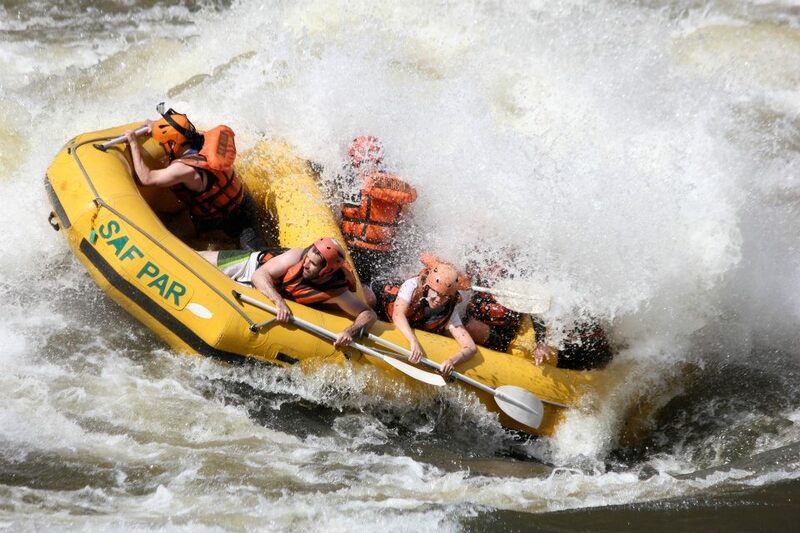 It shouldn’t seem any less dangerous that we couldn’t attempt the Class 6 rapids. In addition to a smorgasbord of Class 5’s and some startlingly vicious Class 2’s, we skirted a few thirsty whirlpools and nearly capsized when our raft was pinned vertically by a massive wall of water. And did I mention the crocodiles that enjoy a good swim in the calm water between the rapids? Yeah. Tell me again why this only comes in at number ten. A rare calm moment amidst breathtaking scenery. Before we departed on our trip, G cheerily informed us that he had never met a client who hadn’t taken a spill on the trip. Dave mirrored G’s cheery acceptance of this probability when we first boarded the raft. By the first rapid, that seemed like a possibility. Our guide steered us to what he casually called a “practice rapid.” In actuality, it was the tail-end of Rapid 9, better known as Commercial Suicide, a roaring Class 6. We had barely hit the first wave when Andrew and I were thrown backward into the water. Andrew, ever unnervingly calm in the face of danger, was easily pulled in while I choked and sputtered on water and felt the boat come down on my head. (I know I’ve compared myself to a drowning bird before, and the simile continues to remain applicable.) Luckily, John managed to pull me back into the raft. Just another blast of water. Check out the grins on our faces. 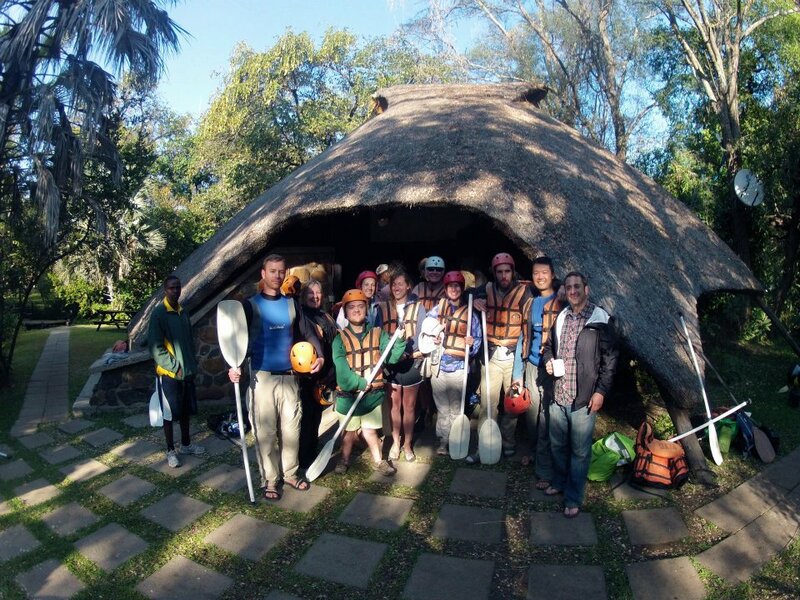 The trip continued in this fashion, with just about everyone falling into the clutches of the Zambezi at some point. Dave had expressly asked the guide to give us a real adventure, steering us straight into the roughest channels of the rapids. We would approach rapids christened with intimidating names like Overland Truck-Eater in a way that no other raft deemed appropriate. All of the other rafts would be quietly queued along some pinnacle of basalt on the opposite side of the river and our raft would be barreling straight into the gurgling pit of water with a bunch of fools on a suicide mission. 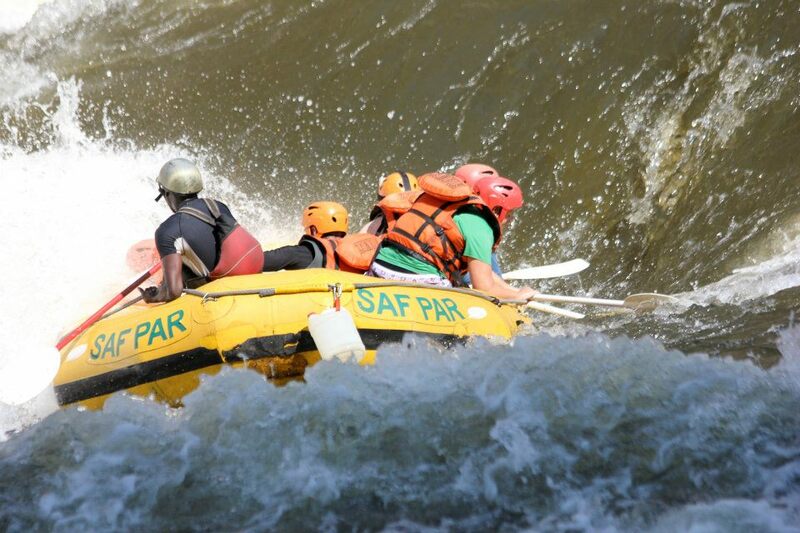 Cue panicked scramble to get paddling once rescued in order to brave the very next rapid. Somehow, we survived rapids 10-25 and washed up on a fine white sand beach wreathed in dinosaurian vegetation. It was a serene contrast to the aggressive river pounding along beside it and the tremulous adrenaline pulsating through my veins as I stood removing my life jacket and helmet with shaking hands. The rest of the day is unmemorable in the shadow of that morning. 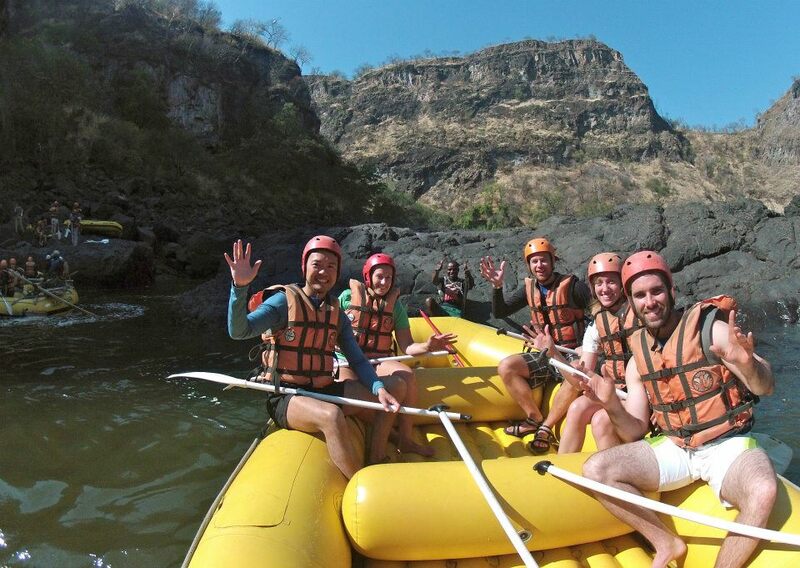 If you’re planning a trip to Victoria Falls, you have to raft the Zambezi. 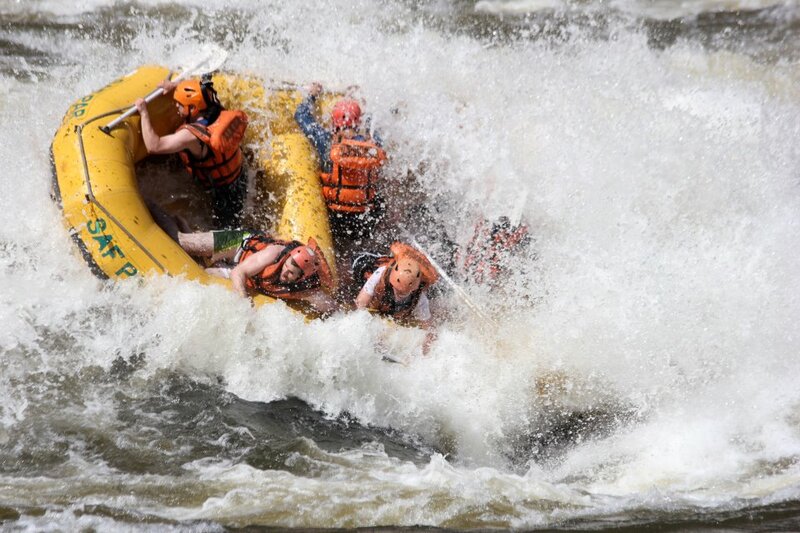 Get a group of adrenaline junkies who can’t vacation without a serious dose of adventure, get in a raft, and tackle The Mother with your fist in the air. The best part about this is that some of us are literally hanging off the side. I love that no one actually paddles in your pictures! Haha they kept telling us to get down! I loved that so much!!!! You captured our experience very well. “dinosaurian vegetation” – haha! another excellent post, Nicole. I especially liked the quote at the beginning and comment about how tourism has “changed.” I’ll never forget the look on your face after getting ripped from our raft at the very first, “practice rapid.” but you got back in and paddled on like a champ!